Oscar Alfredo Ruggeri (born 26 January 1962) is an Argentine former professional footballer who played as defender. Nicknamed El Cabezón ("The Big-Headed One"), Ruggeri achieved success at the international level with the Argentina national team, being part of the teams that won the 1986 FIFA World Cup, two editions of the Copa América and the 1992 King Fahd Cup. At the club level, Ruggeri's most successful stint was with Argentine club River Plate, where he won the 1986 Copa Libertadores (also the club's first win in this tournament) the 1986 Copa Interamericana and the 1986 Intercontinental Cup. 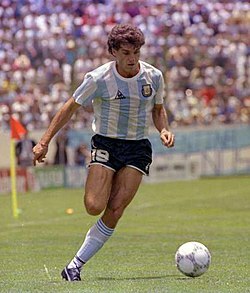 Known for his rough style of play when marking opposing players and aerial ability, Ruggeri is considered one of the all-time best defenders to come out of Argentina. Following his retirement as a player, Ruggeri turned to managing, where he held posts in Argentina, Mexico and Spain. His last job as a manager was in 2006 with Argentine club San Lorenzo. Since then, Ruggeri went on to have a career on Argentine television, as commentator on football shows. He is currently a member of 90 Minutos de Fútbol, which airs in Fox Sports Latin America. Ruggeri started his career at Boca Juniors, playing with Diego Maradona, with whom he won a league title in 1981. In 1985, he moved to rivals River Plate, where he won the Copa Libertadores, the Intercontinental Cup and another league title in 1986. In 1988, he left for Europe where he played for Spanish clubs Logroñes and Real Madrid, where he won yet another league championship. He also played for Vélez Sársfield, Ancona in Italy, América in Mexico, San Lorenzo and Lanús, where he ended his career. During his career he represented his country in three World Cups, captaining Argentina in the final two games of the 1994 competition, after Diego Maradona was expelled from the tournament. Ruggeri was also a key piece in the Argentina teams that won the trophy in 1986 and lost the final to West-Germany in 1990. After losing to Romania in the 1994 tournament, Ruggeri retired from international football having played 97 international games, an Argentine record until it was surpassed by Diego Simeone. Ruggeri played in 21 Copa América games, a national record he shares with José Salomón. Ruggeri's son, Stephan, is a professional footballer. Ruggeri himself appeared on the 2016 edition of Bailando por un Sueño with his daughter, Candela. Oscar Ruggeri holding the 1986 Copa Libertadores. ^ "Oscar Alfredo Ruggeri – International Appearances". Rec.Sport.Soccer Statistics Foundation. ^ Argentina's Greatest Defenders, Sky Sports, 8 June 2010. Retrieved 25 April 2018. ^ a b "Conocé a Stephan Ruggeri, el hijo facherísimo del Cabezón". Ciudad Magazine. 23 July 2015. Retrieved 13 February 2019.